Consumers love new technology. Look at smartphones, for example. When Apple releases even the slightest upgrade, people clamor for it. Elevate Your Wash (and Your Bottom Line): Upgrade Now! Get the complete scoop on our blog. Old Man Winter is likely giving your car wash a workout, and those lines of dirty vehicles are no doubt good for business. Now is a great time to evaluate your wash. When customers are getting great services, you have the freedom to raise your prices to match. 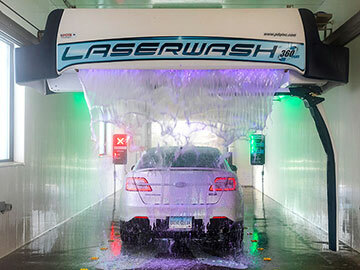 When it comes to your car wash, are you staying competitive in a busy industry? It could be time for an upgrade. The Tandem Surfline and LaserWash 360+ from PDQ are powerhouses of speed, simplicity, and efficiency—the things that have a positive impact on your bottom line. Get in touch with your Harrell’s rep to find out which upgrades will best benefit your wash in 2019. Car wash menus are sometimes referred to as the “unpaid employee” thanks to their unique power to promote sales. Customers (like the rest of us) are drawn to great design and clear content, and will often use car wash menus as a tool to aid in their purchasing decisions. How clear and compelling is your current menu? Does it communicate the value of increased services? Does it promote extras and add-ons visually? Talk to your Harrell’s rep today to start the conversation about menu upgrades. Put your menu to work for you!